I was on The chopper going from mine field to The Santuary on 31Jan 1969. CUSUMANO, Anthony Michael LCpl USMC KIA was at my feet. He died the next day. I have his body and stare with fear etched in my mind always. R.I.P. Semper-Fi! I have a few pictures of these guys. We were in the same fire team. Great guys and i still miss them. From an e-mail sent to me by Dominic Monteleone USMC, regarding PFC George F MEISTER, USMC KIA, 10 September 1967, M 3/26. George and I went to high school together, I joined the Marine Corp in July 1966 arrived in RVN Aug 67. I was with 1st FSR, Then Dong Ha Combat base from 6 June till 25 February 69. I know he was KIA on 10 September, I was just hoping to find someone that remembered him. We were fixing the refer's the day George was brought to Graves Registration. I have been haunted by that day every since. I have searched and searched trying to find someone that knew him, I am hoping someone was with him when he died. I am glad you made it home. My dad is Jerry Shields (SCHIELD correct spelling). He was badly wounded on this day. I have heard this story many times over my life. He is in bad health. If anyone knows my dad and would like to get in touch with him, please contact me at the email above. Thanks and Semper Fi. This Event is per the 3/26 Command Chronology for March 14 1968. I have not been able to verify a K 3/26 KIA for that day. Thought I'd let you know some of the details of Gunny Kemp's death is not correct. I'm sure he was not setting up mortars, I'm pretty sure of that.. We had just come off a night manuevor. Me and Armon McDaniel led the hump most of the night and we got to a hill side and moved most of the company on around the hill to set up for the next couple days. We were probably a couple hundred yards away when we heard the explosion. Word came to us that Gunny had set off a booby trapped existing hole or when he was digging in, I don't remember which. Both legs were blown off at that time. A chopper was called in to medevac him and got there but he died before they could get him out. He died then and not the next day on the Sanctuary. I remember that day pretty well as we all respected and liked the Gunny. Also that day, some jets were working an area we had just come from the night before as a large group of enemy troops had been spotted behind us. The jets, I assume F-4s 's, would start firing their 40 MM way out in front of us and the empty shell casings were raining down on us on the hill side. At first we thought they were shooting at us but soon relized it was their empty casings. We were really scrambling to get under anything we could find to not get hit. Fortunately we all survived it. That's what I remember from that day. Just wanted to let you know even though the official report may be different. I have read some other posts on the military.com site that refer to this incident from guys that were real close to the explosion and with Gunny when he died. While not observing Lt Webber when he was mortally wounded ( although I was in close proccimmity) I can only immagine his commands were just as he was , strong and defining as he always led us. .
A relative account of Lt Webber is on my comments of David Jalbert. David and I arrived in Viet Nam about the same time and were assigned to the same squad and "fire team". We had spent the entire day in a " bomb crater " on the 8th of Dec and were not supposed to move that day. Heavy ground fire from the NVA and another Marine unit kept us from moving around that day, but late in the day the order was made for us to pack up and move forward just 50 yds. It was a fatefull mistake for we were caught in the rice field with no cover at all and just a few yds from the tree line where we were ambushed from. An order from Capt Hoover was called for us to back up to a near ' paddy dike" for cover. When I made it back to the dike my fire team leader Red Webster told me to get my pack off and go back out ( with the aid of Rick " Rick the radio man " Hawkins and retreve the bodies of David Jalbert and Lt Weber. David was reported to still be alive and Lt Webber KIA, just the opposite . Jalbert was dead and Lt Webber was alive but mortally wounded and died soon after we got him back to the paddy dike. Rick and I made the two trips under heavy fire and drug their bodies back to the dike. If I recall this event correctly, it was at night near our ambush location. The woman pulled out what appeared to be a ChiCom grenade, pulled the stringed fuse, threw it at us, which didn‘t travel very far. When she turned to run, the device, with a very short fuse, exploded a short distance from her, and she sustained superficial fragmentation wounds to her back and buttocks area. She was taken into our custody and we transported her back to our CP located in the middle of Quan Nam Province II. After attending to her minor wounds, my Kit Carson Scout, Hung Ahn Vui and I(assigned S-2 Scout) along with the Commander of the Vietnamese Regulars, and his second in command conducted field interview and tactical interrogations of the captured woman. She provided a wealth of information concerning alleged security leaks in our S-3 and other sections. Our H&S S-2 was notified and the next morning, we boarded a helicopter that transported from Quan Nam Province II us to USMC HQ S-2 at Danang. Upon landing, she tearfully fell on her knees, kissed my hands and my filthy boots and thanked me for not tossing her out of the helicopter. I handed her over to a pre-designated prisoner interrogation group in Danang, provided my tactical report and subsequently made my way back to Quan Nam Province II without any further incident that day. Would like to find Doc Bratton. He saved my life on 7 Sept 1967.please contact me. Oscar was my good friend and he was with me when I was WIA on 6/27/67, he helped carry me on board to the Medivac chopper and he was part of the squad that went to our aid when it crashed shortly after take-off. August of 2011 I came across this web-site and met the author Nik Dunbar and other contacts he gave me, after much research in his part I made contact with the family of Oscar in Dallas, Tx, on Sept 08, 2011 the 44th anniversary of his death I met his brother, sister and niece at Oscars burial site. Thus I made good my personal promise that I would never forget him. No words can express the feeling I had the minute I stood in front of his grave and saluted my dear friend. Many thanks to Nik, he is a super person and remains my friend for life Semper Fi! Comment: Outstanding Larry, Nik has come thru again, the website is what its all about, as I did when I came across it Aug 2011, within months I made contact with five from my platoon and the family of my close buddy that was KIA 09/08/67. Larry pass the word on "always on point". Nik you are super! Comment: The three Marines WIA were, Butts, Clark, M-60's, and self, 0311. Michael Norcross pulled me out of the killing zone. I took a AK-47 round in the chest area. There is more to what happen and can be found in search by inputing, " Mulraney USMC" , on the web site. After all these years, it's like it happen yesterday. Comment: I was one of two spotters manning the ship scope, the other was Mike Niuatoa to spot potential target of opportunity. He was the one who spotted artillery sights in Laos and directed spotter planes to mark the target for air strikes, artillery strikes were also directed at those sites. For his efforts, he was awarded the bronze star I have no knowledge of artillery rounds hitting 881 S, had it done so, there wouldn't be an 881 S. My foxhole was in direct line when they fired at Khe Sanh, I heard it constantly buzzing overhead en route to it's target. One of my duties was to scan 881N and the southern ridge line when choppers are inbound to resupply or pick up WIA or KIA. One day, I finally spotted the puff of smoke from a 120 mm mortar tube which was targeting our LZ for the longest time, After the choppers left, we called in our 81's, walked it in and blew the hell out of that site. There was also a AA gun placement directly north of our M.A. 's and 50 cal position. Like usual the only time they would fire was when choppers are inbound or outbound. One day I was lucky to spot double flashes coming from a position on 881 N. With the help of the M machine gun team spotting with the ship scope and my M-14 with tracers which I zeroed in, we waited patiently for the next resupply chopper to land. We didn't have to wait long, another chopper came in and when we saw those double flashes again, we jointly eliminated that AA gun by using the ship scope and M-14.. We celebrated after more choppers landed without any sight of flashes coming from that site. Many incidents happened without Capt. Dabney knowing, we just did whatever we needed to survive. Some of us went on without recognition, deep inside, I guess it was just a duty to the Marine Corp. I thank these few good men for all they did, I know they helped save many lives. Comment: 3 July 2012 - Talked to Ron Smarker on the phone, he told me that he was one of the 3/26 Originals. He was with Mike 3/26, as a squad leader. On 10 February 1967 he was hit several times. He was evacuated and spent about eight months in the hospital. He is doing well. Comment: I was the Marine that detonated the mine on 7 Jan. 1967 @ 0935. I would like to say how I appreciate the effort you put forth in creating this database for all the Marines that served with the 3/26 in Vietnam. CPL Gerald A. Genco USMC retired. Comment: I was there at this time, my bunker, very dark and raining hard, he came out of the bunker. I was in fox whole just a few feet away. He said he had to go up hill, I said not yet we needed to change positions and secure the claymores first in front of the bunker. The other guy was a "pig " driver and I have his photo. But Steve rap a poncho around himself and took off up hill. A few seconds later he was hit, friendly fire. We spent the next week with only two of us in the bunker and the NVA started probing every night. I got the picture from John Currin he and I were in I, 3B 3/26 together he was wounded for the third time on Aug 19, 1969 and medevaced; was the last I saw him and it was this past February when he contacted me after 43 years, we have been emailing each other since. John Currin is in the top left, the corpsman in the middle I don’t remember, myself top right, Frank Talarico bottom left and Juikine (Waakine) LedeCruz bottom right. Pictured was taken on USS Tripoli in May after operation Oklahoma Hills. I have not attended a reunion and haven’t made plans for the upcoming one. Comment: There is a good probability that this is the flight that medevaced Mike Company's casualties for the incident at DTG 01190930. Comment: I was WIA during this action. There is a lot more to this action then what the after action reports. I wrote about this action in the Marine Corps Gazette 7/04 under "Sting Of Battle". This relates to the CC-entry from 0302_1967, ambush by Mike 3. Comment: Background: I grew up with Larry. He was 2 years older than me, but we did alot together. I had no siblings, so Larry became the "big brother" that I looked up to. He was the quiet type. He didn't give anyone any crap and he didn't take crap from anyone. His father died with TB when Larry was 7 or 8 years old, and thereafter Larry was very protective of his mother and younger sibling. Strong, determined, and a good heart is how I would describe Larry. A granite marker with Larry's name and Marine photo still stand in our hometown city square. I visit his grave each time that I visit my mom's. I would welcome hearing from anyone who served with Larry in Vietnam. Comment: The County Fair is one of the first experiences I remember with Lima Company. Somewhere in my training prior to arriving in Vietnam, I had seen a film of Marines taking part in County Fair operations. I remember thinking that the activities looked like a bit out of place in a war zone, and yet there was a good idea about the concept and hoping that I would have the opportunity to have that experience when I was in Vietnam. The CAP program with the Marines and the PFs working together to protect the village was also an idea I found very appealing. I thought that would be a good job to have. Our primary duties that day were to secure the village; no one comes in or leaves the village, and the searching of the people’s homes and property for contraband. Having too much rice, was almost as serious an offence as having a weapon. Welcome to Vietnam. A squad member took three or four of us “boots”, in the heart of the activity and explained to us what was going on. The Marine band and Vietnamese actors provided entertainment, storytelling and propaganda, reminding the local people that we were the good guys. 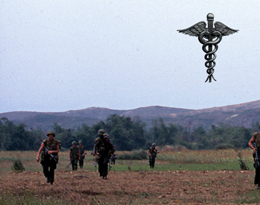 The Corpsmen were there to treat people’s ailments and to make friends. The CAP Marines and CAP PFs helped the National Police check the villagers’ identification papers and deal with those that were suspected VC or sympathizers of the VC point of you. It would take a while for me to learn that being taken away by the National Police was never a good experience for the Vietnamese people. Any male person of military age found in a village was immediately suspected of being a VC or VC sympathizer, until he produced leave papers from his unit. The CAP PFs were of military age and they usually lived in that village or in a near-by village, of course they always had identification papers on their person. I was on patrol with the Mike 3 unit and somewhere around the 2nd day, filled my canteen from a stream running next to where we had taken a short 10-minute break. Although I treated the water with 2 Halazone tablets and waited the prescribed 60 minutes for it to take effect, I started to experience problems and several days later when we returned to the Phu Bai base I was sent directly to an aid tent. For the next 8-9 days I was treated for an extreme case of amoebic dysentery. What makes this event stand out in my mind was that even after returning to my unit, I had no memory of that week and a half spent in the aid tent and my platoon commander, Lt Manzi, told me that when he had come to check up on me after a few days, I was delirious and in a coma-like state, hooked up to intravenous fluids. Looking back at that incident, it seems curious to me that, although I was wounded 3 times during my Vietnam tour, with the first aid training I had received in the Marines Corps, I could probably have survived each of those occasions on my own but the encounter with dirty water would have killed me for sure. From an e-mail by Bill Ward. Comment: LCC-11 is the USS Eldorado, a Command ship. I would think that the flight was a visual reconnaissance flight of operational commanders. Comment: JAMES, RICHARD DALE (Synopsis) The President of the United States takes pride in presenting the Silver Star Medal (Posthumously) to Richard D. James (2382319), Corporal, U.S. Marine Corps, for conspicuous gallantry and intrepidity in action while serving with Company L, 3d Battalion, 26th Marines, 3d Marine Division (Rein. 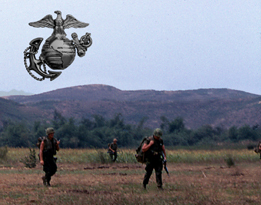 ), FMF, in connection with combat operations against the enemy in the Republic of Vietnam on December 8, 1968. By his courage, aggressive fighting spirit and steadfast devotion to duty in the face of extreme personal danger, Corporal James upheld the highest traditions of the Marine Corps and the United States Naval Service. He gallantly gave his life for his country. Comment: 1Lt John Manzi is mentioned in the book "Ambush Valley", on pages 85-86, 90, 145-146, 170, 301-302. Comment: A Note from The Virtual Wall In the latter part of Operation MEADE RIVER the 3rd Battalion, 26th Marines formed a cordon line on the north side of Route 4 west of Dien Ban. As the cordon was closed, compressing the area held by the enemy, the fighting became fiercer. On 04 Dec 1968 India 3/26 engaged an enemy force entrenched in a tree line, losing four Marines and one Corpsman: Cpl Reid R. Ross, Flinton, PA (Silver Star); HN James C. Tarrance, Jacksonville, FL H&S Co w/ I/3/26 (Silver Star); Pfc Jerome A. Long, Beloit, KS; Pfc William F. Marasco, Rochester, NY; and Pfc Marlin Smith, Los Angeles, CA. Comment: A Note from The Virtual Wall. In the latter part of Operation MEADE RIVER the 3rd Battalion, 26th Marines formed a cordon line on the north side of Route 4 west of Dien Ban. As the cordon was closed, compressing the area held by the enemy, the fighting became fiercer. On 04 Dec 1968 India 3/26 engaged an enemy force entrenched in a tree line, losing four Marines and one Corpsman: Cpl Reid R. Ross, Flinton, PA (Silver Star); HN James C. Tarrance, Jacksonville, FL H&S Co w/ I/3/26 (Silver Star); Pfc Jerome A. Long, Beloit, KS; Pfc William F. Marasco, Rochester, NY; and Pfc Marlin Smith, Los Angeles, CA.